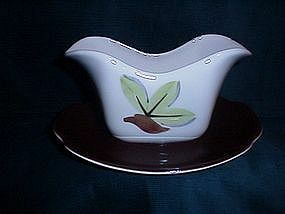 Continental Kilns Woodleaf pattern gravy boat with attached underplate. The pattern is marked on the bottom. The boat has a small chip inside the rim, otherwise in great condition.